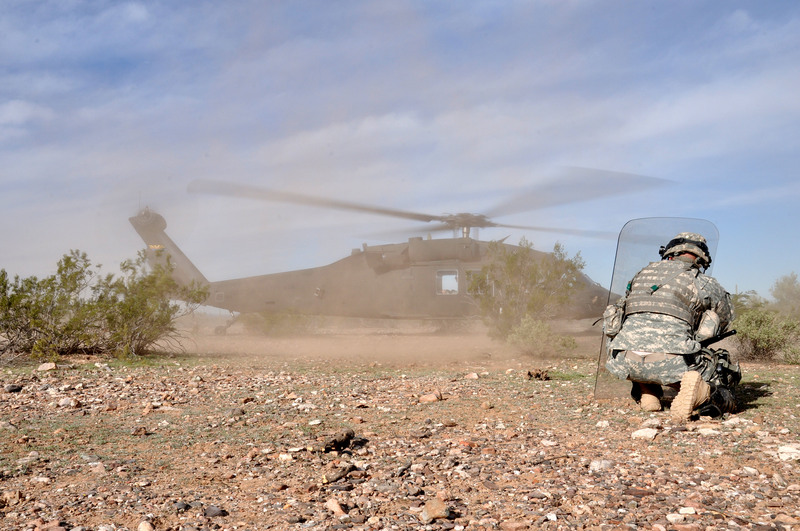 FLORENCE, Ariz. – Super Bowl XLIX, deemed a success by state officials and the NFL, brought added benefits to Arizona by providing the state’s Army National Guard with training used to prepare them to support civil authorities in the event of a major emergency. More than 100 Soldiers from the 856th Military Police Company spent the month of January training to become the state’s National Guard Reaction Force, or NGRF, at the Florence Military Reservation here. Fortunately, civil law enforcement and first responders masterfully kept residents and guests safe during the many event leading up to the big game; but in the event of a major incident, Arizona’s Guard members were prepared to serve as back up. Burman explained how Soldiers were at home, not deployed to an overseas combat environment, so ensuring troops understood the rules of engagement was critical to mission success. He said that it was important that Soldiers respect citizens’ First Amendment rights, which means training focused on the appropriate actions when unlawful acts take place. During the training, Soldiers exercised a scenario where several people were disturbing the peace during an unauthorized protest. The outnumbered law enforcement agency requested National Guard support. The purpose of the scenario, according to Burman, was for Soldiers to understand their role as integrated support to civil agencies, not as primary law enforcement. “We are never there to handle a civil situation directly on our own,” he said. One of the unique advantages of being a Citizen-Soldier is having a civilian job that contributes to the mission. Company 1st Sgt. Matthew O’Halloran estimated that around 20 to 30 percent of the Soldiers in the 865 MP Company are employed full time by law enforcement agencies. They brought their real-world experiences to the training environment adding nuance and enrichment to the training. “A lot of our work involves helping law enforcement, and when you come into a situation – like we have in the past – where the military and law enforcement speak different operational languages, having somebody who is proficient with both the civilian agency and military vernacular, makes integration that much easier,” Burman said. Communication is another fundamental skill for military police officers. It was not uncommon during briefings and rehearsals for junior Soldiers to be quizzed by leadership on their knowledge of the mission prior to taking action. Although the MPs' annual training has come to a conclusion, the Soldiers are now better qualified to serve in a NGRF for local emergency response agencies in times of need. Their training, however, never really ends.